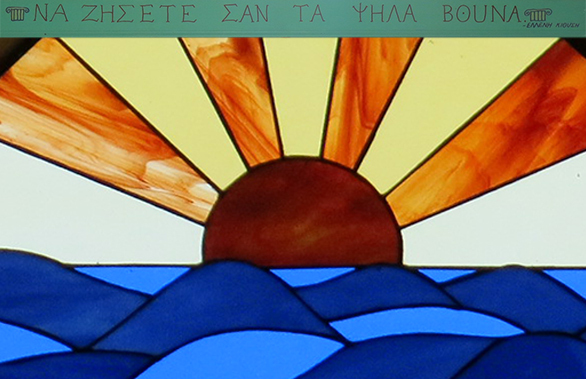 We often are asked about the Greek words painted under the dining room stained-glass window. “Να Ζήσετε Σαη Τα Ψηλα βουηα.” If my husband happens to intercept the question, you will be privy to his perfect accent and possibly a story or two about the Greece his father grew up in. If I am your translator, I apologize for my inferior pronunciation. I mean, I am just a girl from Ohio after all, I do what I can. Those of you in the longtime customer category may have had the distinct honor of having Perry render the translation for you. And if that is the case, I would bet he crossed his hands gently over his chest, leaned back into a soften stance and affectionally invoked his mother’s name. The quote translates to “Live tall and strong, like the mountain,” the sentiment Perry’s mother bestowed upon him before sending him into the world. When Perry was just ten years old, his mother sent him down into the village to find food, to find work. They lived in such poverty that at times his mother, Eleni, would boil sticks and leaves to make tea. When he was in his late teens, she urged him to go to America. At the time, Europe was reeling from the wounds of World War. Even in the mountains of Greece, the landscapes were battered, and the people were deeply bruised. She knew that to love him was to let him go. And go he did, but we will save that story for another blog. As we begin our 39th season in the building he built, we pay tribute not only to Perry, but to his mother, Eleni, whom our daughter is named after. She was courage and strength and perseverance made manifest. Her legacy lives in every person who believes in the tenacity of the human spirit, in every person who sacrifices for the happiness and well-being of another, in every person who lives tall and strong like the mountain. When you look under the stained-glass sun, you will know the story behind her profoundly personal proverb. And we hope you will pass it on.